Keiji Inafune sounded an ominous note at the beginning of his presentation during the Game Developers Conference last week, saying to the audience that "there might be some harsh comments, so please be prepared". Turns out the trigger warning from one of Japan's most respected game designers was warranted as he criticised the mindset that's crippling present-day Japanese game development. During his hour-long session at GDC, Inafune said that he feel like people look at Japanese games as a thing of the past. Titles from his homeland are like the Beatles, Steve McQueen or a 1968 Corvette, he offered, just great memories of former glories. "It's like we're in the Edo period, dressed up in topknots. There's a limit to how far you can go on just those memories. The Beatles will never put out a new song with all four members; Steve McQueen's not going to release a new movie." 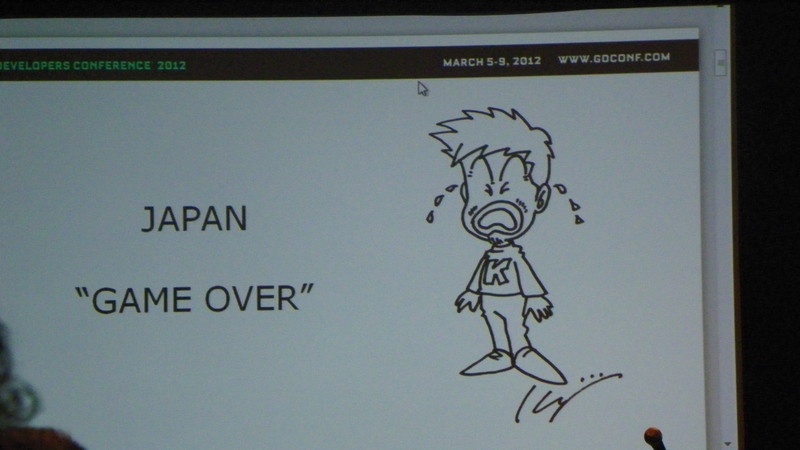 "So we just stick to our memories and up-rez a game to ship an HD version," Inafune continued. "I walk around and am fortunate to have fans say Mega Man! But those fans don't just want Mega Man. They want something more." Thoughts like this aren't new from the longtime game-maker. Before Inafune left Capcom two years ago, he'd railed against the games coming out of Japan. He's started two new companies — Comcept and Intercept — since then, and has been thinking about how his future games can become globally successful. In development for the 3DS, Comcept's upcoming King of Pirates is based on the Chinese epic Romance of the Three Kingdoms. "Everybody knows the story, especially in China and Japan," Inafune says. And now we're putting it into a new genre. It's so popular is because it delves into human emotion. It's about love, betrayal and friendship. That's going to migrate into a lot of cultures. It's not just about how you look. We all have those emotions." Even as he's making new games, Inafune doesn't want to escape the connection between himself and his most famous creation. At a talk where Inafune discussed the desire to create new things and leaving the successes of the past behind, the first question he got asked is about Mega Man. Does he want to escape the Blue Bomber's shadow? Not at all. "People have a lot of passion for Mega Man, and it is my baby. So, it's always rewarding to be associated with that character." Inafune compares this dynamic to his own love of movies. If he were ever to meet Ridley Scott, he says, he's ask him about Alien and the director's other past work. He's a fan, too, and understands how fans react when they meet creators. Inafune made use of a character that looked like classic character Astro Boy when talking about past Japanese cultural creations that became global phenomenon. That made me think about the symbolism of the two robot heroes. If Astro Boy represents post-war Japan's reconstruction as a world power, where the nation's building themselves back up, then could Mega Man be seen as another kind of representation where Japan takes elements from other cultures and uses that to make themselves stronger? Inafune laughed when I asked him this question, responding "If it was intentional, it would have been really cool, wouldn't it?" "You could say, ‘I'm a genius,'" he chuckles But Inafune admits to that kind of meaning. Kenji Inafune - one of the only Japanese devs that knows what's up. I agree, Steven. Gamers themselves are very guilty of this, though, where new franchise concepts don't always pick up as quickly, even when they're amazing. Part of that's the $60USD cover charge of "AAA" console titles, though. The successes of Apple's market have shown that the strongest market is still the casual pass-time market, where accessibility is the key component to makikng or breaking a game. The games market isn't necessarily one market, though, and it's important to acknowledge that. As a beginning developer, my thoughts are constantly on which "section" of the market I am most likely to appeal to, and whether or not it will appeal to fringe players who are dedicated primarily to other audiences. We're not all pegs, though, so there's a fair amount of overlap. I think the most important thing you can do is to try and make a damn good game, and listen to constructive criticism from all angles to try and get to the root of what's actually necessary. great game design often combines accessibility and complexity. Plants Vs Zombies is a great example of a game that is accessible to start with then develops into quite a complex tower defence game - it takes you on that journey brilliantly. Suddenly a "non gamer" who would "never be into games" is right into something they would have completely disregarded as being of interest to them before. Accessibility can also be through theme and content. I'm amazed how many 'non gaming' friends watched me play the Uncharted games from start to end and wanted to have a go themselves where previously they were completely un-interested in games with the same primary mechanic (for all intents and purposes, GoW has similar mechanics as Uncharted when it comes to most of your time running around covering and shooting). That being said, there are no interesting ideas in Uncharted, you are quite right that people who buy and play games are the guilty ones for lack of creativity, we talk with our wallets. Maybe we are on the start of falling into the same abyss as the Japanese industry! Take the time to buy and play interesting, unique and creative games and we'll avoid that same fate! You can't help but feel bad for Kenji Inafune. He sees there's a massive problem, doesn't quite have a solution, and to top it off he sounds like he's slamming the very industry he's out to save.